The definition of risk is the possibility that something unpleasant or unwelcome will happen. Most growers, understandably, view it in terms of what might happen should they do something that’s different from what their neighboring growers are doing. 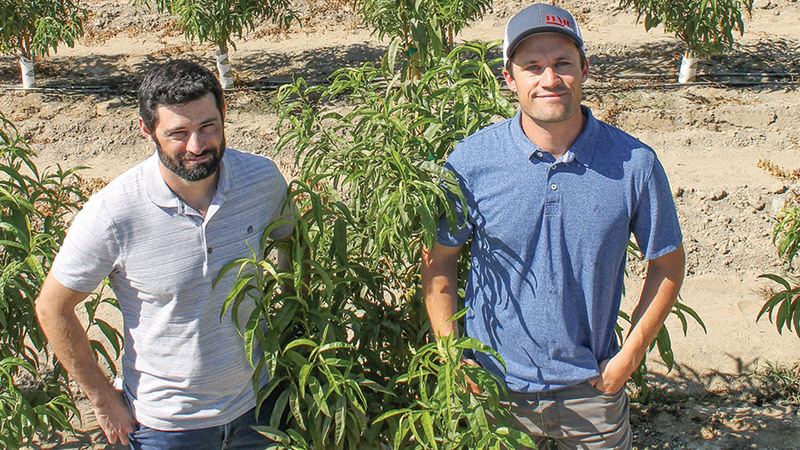 Jon McClarty and Drew Ketelsen do too, but they’re far more concerned about the consequences of doing nothing, so they’re planting one of the few U.S. single-leader peach, plum, and nectarine orchards on trellis to prepare for mechanization. The two men farm approximately 2,000 acres of peaches, plums, and nectarines in Kingsburg, CA, just south of Fresno. McClarty, 37, is president of HMC Farms; Ketelsen, 34, his brother-in-law, is vice president. Farming in the stone fruit Mecca — more than half of the country’s peaches, plums, and nectarines are grown within 50 miles of Fresno — is great in any number of ways. The climate is obviously a huge advantage, but so is the fine soil. Both men will quickly tell you it’s the best place to grow peaches and nectarines, period. But just because it’s a great place to farm doesn’t mean it’s a particularly profitable place to farm. The problems of producing peaches, plums, and nectarines in the San Joaquin Valley have been well-documented. Since 2000, a number of longtime grower/packer/shippers have disappeared. In 2011, the California Tree Fruit Agreement (CTFA), an organization that administered the federal marketing orders for those fruits, was dissolved after it failed to get the necessary two-thirds support. At the time, CTFA, which was founded in 1933, represented more than 900 grower-shippers. Things are not getting any better in the ensuing decade. “Our industry has shrunk way down in the last 10 years,” says McClarty. U.S. stone fruit consumption has continued to decline, he says, despite strong efforts by growers in recent years to boost quality through any number of means, including improved varieties and newer postharvest strategies, such as preconditioning. But none have adequately moved the needle on profits, forcing McClarty and Ketelsen to make some tough decisions. First of all, they needed to change the way they farm. The fruit they grow is labor-intensive, and that doesn’t pencil out so well these days, and won’t pencil out at all in the future. The labor issue — see “Labor of Love” — was only going to get worse in the future. They decided they needed to make a change. Two and a half years ago, on a trip to Chile to visit a business partner, they hit on what they needed to do to reduce labor costs. 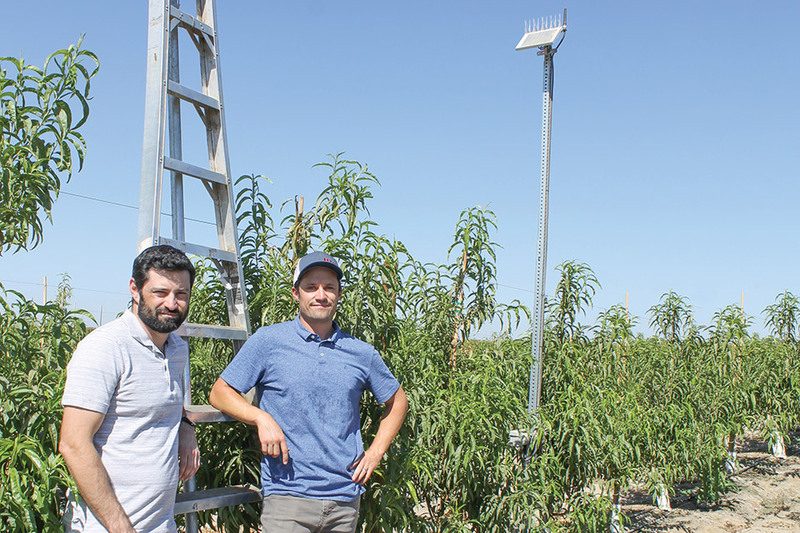 They saw a high-density peach orchard planted on trellis, the goal being the same as it is with other crops, reducing labor costs by increasing mechanization. Winegrape growers have been doing it for decades, and it’s currently all the rage in apples. But McClarty and Ketelsen had never seen it tried on a commercial scale in stone fruit until that day. So in 2018, they planted 60 acres of single leader stone fruit on trellis. Moving forward, they decided to do all replants on this trellis, beginning this year. Like many progressive growers, they look to renew 5% to 10% of their acreage each year. This coming year, that amounts to replanting 160 acres. The reasoning behind it was the same as for the other crops. Ketelsen, who has a civil engineering degree from Cal Poly San Luis Obispo and worked as an engineer in San Francisco prior to joining HMC in 2009, says it was clear that a linear structure was needed. They’re planting the new orchards at 670 trees per acre, about five times denser than the industry standard. Ketelsen says they will let the trees get 10.5 feet tall. That’s shorter than the 12-foot-plus trees in some of their older orchards but on par with the conventional orchards they have planted in the past half-dozen years. 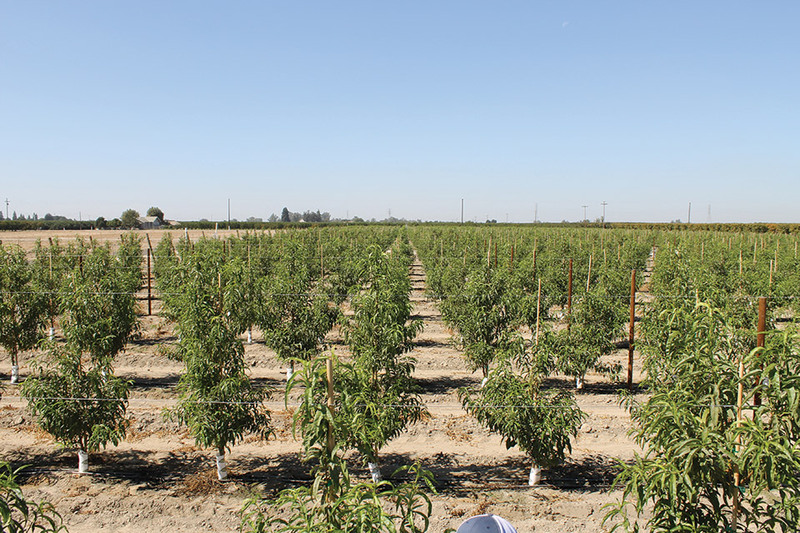 The goal is not necessarily increasing per-acre production, it’s primarily to reduce labor costs, Ketelsen says as he walks through a 10-acre block of ‘Zee Fire’ nectarines planted in January. Production from a conventional block of this type would be anywhere from 650 to 850, 25-pound equivalent cartons per acre, and he expects a similar amount from this block. Going for greater yields could potentially be a problem in getting the right size to market. During thinning, they typically take two-thirds of the fruit off the tree, depending on the variety. McClarty is quick to point out that other than the trellising and density, their planting program has not changed. They will continue to grow about 25 varieties of peaches and a like number nectarines. It’s necessary to plant so many varieties to stretch the season out. They harvest the former “summer fruits” from late April to early October, depending on the year. McClarty emphasizes they’re not doing any trials. This is no pilot project. There is one key advantage to the new blocks in that they are more precocious. With standard trees, they get a first, light crop in the third leaf. With these trellised orchards, they expect a light crop in the second leaf, and close to full production in the third. Of course, that is little consolation in light of the significant up-front costs. The bamboo stakes and the rest of the trellising materials are not cheap, and the increased density comes with higher tree costs. Add it all up, and Ketelsen says it’s roughly five times more expensive than a conventional orchard. Ketelsen surmises that sounds prohibitively expensive to other stone fruit growers who have come by to see what HMC is doing. So why take the risk? McClarty says they didn’t know if anyone else was going to do it, and someone has to be first, so it might as well be them. The first and most obvious problem with farming such a labor-intensive crop as stone fruit is the issue of availability, says HMC Farms President Jon McClarty. Second, comes the quality of the labor. Older workers have more experience, but they won’t be around forever. That means relying on a younger workforce who find the job less desirable and consider the position temporary rather than a career. With a workforce that is constantly turning over, fewer people have the knowledge of how to skillfully harvest stone fruit. Learning the subtleties of which pieces of fruit are ripe for harvest takes several seasons to perfect. This increases the amount of supervision required to maintain the quality HMC expects. The company pays an hourly wage at harvest, but the industry is mixed in California, says McClarty, with some growers paying hourly, others piece rate, and still others a combination of the two. It is energizing to see the “next generation” leading the stone fruit industry with new methods and one has to admire their passion and “love” for the industry. Well done Jon and Drew! You are headed for success.